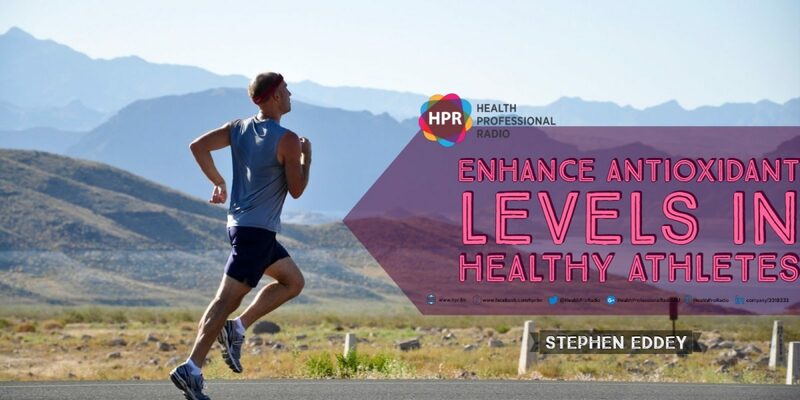 Nutritionist and Naturopath Stephen Eddey returns to Health Professional Radio to promote the extraordinary health benefits of Ubiquinol and how it can give people (both athletic and non-athletic) that extra energy boost that they need. Stephen Eddey is the Principal and CEO of Health Schools Australia, also known as the International College of Complementary Medicine – Australia’s longest established natural medicine college. He is also a leading naturopath and nutritionist. Tabetha Moreto: Hello everyone. You’re listening to Health Professional Radio and I’m your host for today, Tabetha Moreto. Our guest today is Stephen Eddey, the Principal and CEO of Health Schools Australia. Today, we’re going to talk about Ubiquinol and how it can help one’s athletic performance. Without further ado, welcome to the show, Steve. It’s so nice to have you here again. Stephen Eddey: It’s great to be here again. I love coming back and talking health. S: Yes. My pleasure. Me too, I love talking about health. T: So Steve, can you please tell the audience about yourself especially those who didn’t tune into our last interview? S: Sure. Yes, my background – I started off life as a chemist working in Melbourne and of course then moved on to naturopathy and got a diploma in Naturopathy then a Bachelor of Health Science and a Masters of Nutrition and Diet. I taught nutritional medicine and naturopathy for about 12 years and now, I just work for a supplement company and we talk about health all day and there are podcasts and everything. So I’m still in the field and have been for over 20 years. T: Fantastic. So Steve, tell us about Ubiquinol. From what I know this is a type of nutrient that’s important for energy performance. Can you please tell the audience more about this, please? S: Sure. Ubiquinol is commonly known as CoQ10 but it’s a specific form of Coenzyme Q10 because of the reduced form, in other words, the active form in the body. And it’s used to, as you correctly pointed out, make energy in the body and it works in a part of the cells called the mitochondria and it works in the part of the mitochondria called the electron transfer chain (Don’t worry about that). It’s basically in the part of the body that makes energy. T: Very interesting. I know that a lot of athletes take this particular supplement but for somebody like me who’s not really an athlete, can we benefit from this particular supplement? S: Sure. Yes. Naturopathy, CoQ10 or Ubiquinol help people with heart disease, congestive heart failure and it’s good for reducing high blood pressure. So it’s very good for the cardiovascular system that the nutrient concentrates in the heart. It’s very very good for that and of course, it gives you more energy throughout the day. I’m a non-professional athlete. I do a bit of running, swimming and … I’m not a super athlete but I take this every day as well. It certainly supports me, also getting up there new. I’m 49. So everything else, you’d be probably aware. T: Wow. I guess this is something that I can take as well. S: It’s found in your food too. It’s found in beef and liver and all this sort of stuff. It’s not a weird out-there stuff. It’s found in food already and if you take the supplement, it just supplements your dose up to therapeutic levels and there’s this recent study pointed out, it certainly does help. T: Yes. It does sound like it indeed. Can I ask you, Steve? What are the effects of having low CoQ10 levels? What happens to a person’s health if their CoQ10 levels are too low? S: Simple. Basically, if your CoQ10 levels are too low, you end up with deficiencies in energy and a lot of people who take certain cholesterol medication called statins, statins actually naturally reduce Coenzyme Q10 levels in the body or ubiquinol levels in the body, and these people suffer muscle pain fatigue, forgetfulness, those sorts of things. So they’re the classic symptoms associated with a low Coenzyme Q10. T: I see. Can I ask you something, Steve? For example for someone like me, as I mentioned earlier, I’m not really an athletic person and I take a multivitamin. Can someone who is taking a multivitamin also take ubiquinol as well? S: Of course. they can. Ubiquinol is slightly different to a multivitamin because it’s a fat-soluble nutrient that is not commonly found in multivitamins and even if it is in multivitamins, that’s about 10 or 20 milligrams. If the studies show that you need about 200 milligrams a day to get a good therapeutic dose, you really need to take it on its own with meals but preferably your heaviest meal that it’s usually dinner. T: Fantastic to hear that. So Steve, what can you tell our audience out there about ubiquinol? Tell them something about why they should take it. S: Sure. Look. Well firstly, they’re probably taking it already in low doses in their food but the reason why they should take a therapeutic dose is because study after study and there’s one just recently that they did on athletes, which basically meant that they improved their athletic performance, time, fatigue – all these sorts of factors. So it’s very very good to help you get through your days. Obviously, it’s terrific if you’re doing some exercise and if you’re not, you should be anyway. But it helps give you the energy to get through your days and everybody wants more energy. I mean, it’s something, I’ve never in all my years of practice, I’ve never had someone come to me and say, “Steve, I’ve got too much energy. What do I do about it?” It’s always, “I’m low on energy.” So it’s great to take it every day. It’s good to protect your heart and as I said, reduce blood pressure and it’s a great antioxidant as well. S: Yes. You wake up at 5:00 in the morning. You go, “I’ve got too much energy. What do I do?” Go for a run. “Oh. I can’t do that.” Well, you can. This is what ubiquinol will help you do. “Sure. When?” Get your shoes on for your winter and all that sort of stuff but it will give you that enough energy to actually get through your day. So after your eight hours of work, you may be able to have enough energy to go for a walk after dinner or go to the gym on the way home or do what I do and swim at lunchtime, sometimes. I mean, it’s a great sort of supplement to give you that spark just to help you go through your days. T: That’s fantastic. Steve, for those who want to get in touch with you, how can they do that? S: Well, the best way to get in contact with me now is probably via a website called ATP Science and ironically, the company that I work for has ATP, which is a symbol of energy in the body. So if you think of an atpscience.com, that’s where I’m doing a lot of work these days and they can contact me through the website that way. T: Fantastic. Thank you so much, Steve, for coming back on the show. It’s always a pleasure having you here. S: It’s great to be back and then it’s great when these new studies come out confirming what you’re already doing. T: And that was Stephen Eddey, Principal and CEO of Health Schools Australia. If you liked this interview, transcripts and archives are available at www.hpr.fm. We’re on all social media platforms. So don’t forget to follow, like and subscribe. Show us some love by subscribing to our HPR YouTube channel. We’re also available for download on SoundCloud and iTunes. This is Tabetha Moreto and you’re listening to Health Professional Radio.